No doubt you are wondering what happened to me? Well it appears that Christmas preparations and vacation plans took over my life...so much for Twelve Christmas specials I had hoped to share! With the new year upon the horizon, the other specials will have to keep until next year's holiday season! But--next year I will be starting much earlier and may instead, do Twelve WEEKS of Christmas, starting in October, so nothing interferes with getting them out! The snows started earlier than ever in the Northeast U.S. this season...in November! Our kids are older now (19 and almost 15) so snowstorms don't have the same allure that they used to when they were little...our 19 year-old son now understands why adults aren't crazy about snow and ice-because now he has to get up earlier and go outside to get it all off his car so he can drive to college! And our (almost 15 year old) daughter would rather snuggle inside with her robe and Silky Terrier-watching a movie with a bowl of popcorn instead of loading on all the snow gear and going outside to play in it! I miss those days when we would bundle them up and send them out with their sleds, shovels and buckets so they could create Snow Forts! I used the SNOW jumbo wheel for the background (from the holiday mini collection) with one of this year's In Colors (Soft Sky). I love this wheel-and hope it returns in the next fall-winter collection! Since Stampin' Up! only produces the In Colors for ink pads, ink refills, cardstock and ribbon, I had to create this color for the wheel by using the refill ink in an empty jumbo ink cartridge. Soft Sky cardstock coordinates beautifully with Taken With Teal, so these are the two main colors I used for the page. The punch I used for the snowflakes is Spring Flower Bouquet-which is on the retired list and will no longer be available for a few more days! To see a complete list of what is on the retired stamps and accessories lists, refer to the sidebar for the most recent update. If you wish to order anything from the current catalog, please contact me by noon on December 31-New Year's Eve at the latest. We have plans for New Year's Eve, as you probably do as well, so after noon, I will not be placing any other orders from the Fall-Winter Collection. To learn how to make the icicle border at the top of the page, go to my Icicle Tutorial. To order any of the products listed above, please e-mail me. It's so much fun to be a Stampin' Up! demonstrator and to be able to play with all the toys in the catalog! There are not enough hours in the day though, to play with everything! So buying a table at Craft Fairs gives me the opportunity to really use the products and stamps! When you read these posts, anything highlighted and underlined is linked to more information about that tag..so just click on these words to learn more about the stamps, products and other information! 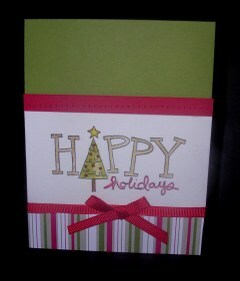 I didn't make alot of Christmas cards...but chose just a few to offer. This card was actually a case-except I saw the original it jumped out at me and said SPINNER CARD! So this is the spinner card I created and also changed the Designer Papers used! I find it very relaxing to make these and folks LOVE playing with them! I showed a friend of mine one of these and she could have played with it for hours!!! Did you know they are actually therapeutic?? Evidentally they are-to the creator as well as the recipient! I really like these colors together-Soft, yet stunning! 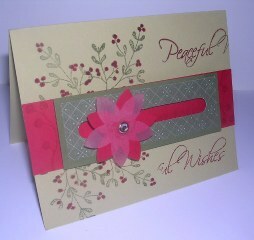 Peaceful Wishes is a lovely stamp set! This card was a Workshop Wizard sample provided by Stampin' Up! I've used this as a Make & Take project at workshops this month and everyone seems to enjoy making it-The watercoloring is simple enough for even a beginner and the paper-piercing adds a nice touch. 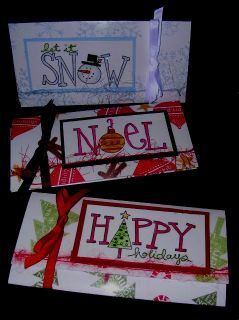 I also used the other stamps in the Big On Christmas set to make these adorable Gift Card Holders I CASED from Amy Celona-she has a great website! You can find the tutorial HERE. 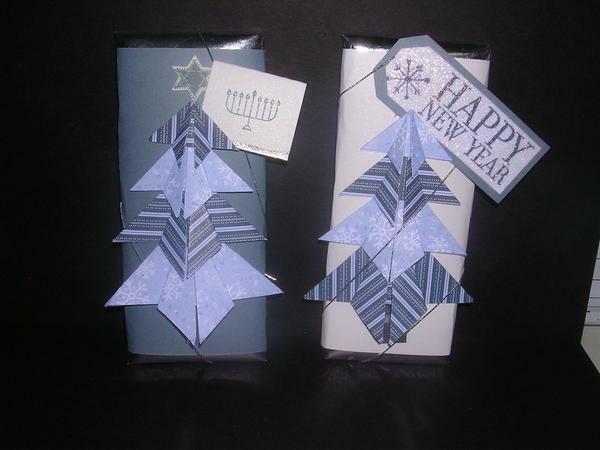 She made them as moneyholders-I made them as Gift Card Holders since they have become a popular gift-giving idea. Can you guess which one sold out first? If you guessed the Let It Snow holder, you are correct! 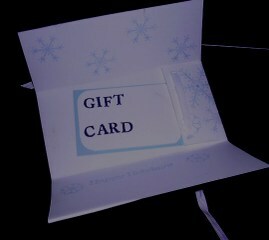 These Gift Card holders can also double as money holders...with three designs to choose from, they sold like hotcakes! It's amazing how many people give money or gift cards for the holidays-it's great for folks who don't like the shopping scene...(so NOT like me! It wouldn't feel like Christmas if I didn't get out the malls and do some real shopping and fight a few crowds during the holidays!) I added some interest using last year's Fancy Fibers which came in different colors and textures...(if you click on the pictures, they will show up magnified so you can view details!) These were lots of fun to make...and very popular-I guess I need to make a alot more of these in the future so I don't run out of them! 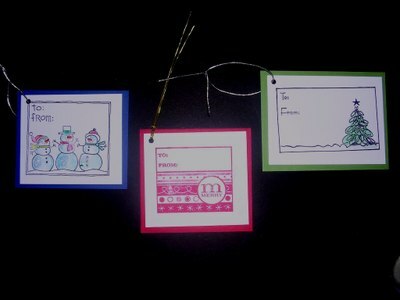 The Make & Take project I offered at the Mistletoe Market Craft Fair for visitors to try was a holiday gift tag using the adorable TAGS FOR ALL stamp set from the Stampin' Up! Holiday Mini Collection catalog-once again, the snowmen stamped tag was also the most popular tag! I guess snowmen are pretty popular these days-throughout the whole holiday and winter season! These tags were quick and easy to demo and make-we used the Aqua Painter and Watercolor Pencils to color in the images after stamping with the Black StazOn Pad. Folks were amazed that you can simply "scribble" some color where you want it, then use the Aqua Painter to pull the color and blend it. The Aqua Painter has a water well at one end-when you lightly squeeze the soft-barreled pen, it dilutes the inked or watercolor penciled image so you can adjust how much color you want! An AMAZING invention! and so much easier than even using a watercolor brush with a cup of water!!! I think everyone liked the snowmen becuase we also jazzed it up with some glue and glitter sprinkled on to finish it off! (this may not have come thru in the photo-try clicking on the photo to enlarge it and maybe the glitter will be more noticeable) Of course our new Elastic Gold & Silver Cord are great ways to attach these to gifts-they also make great hangers for ornaments! The kids were kept busy at our table playing with the two Tattoo Kits offered in the Fall-Winter Collection! One is basically a boys kit and the other is a girl's although some of the stamp images are interchangeable...the kits are WONDERFUL and kids just love them! I remember when my children were younger (just a few years ago!) and they would entertain themselves for quite a long time-stamping every inch of skin on their bodies!!! Yes, the ink pads and markers included in the kits are water-soluable and non-toxic!! I did take orders for these when parents saw how much fun their kids had with them! 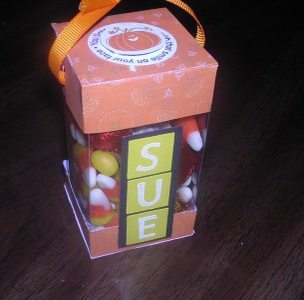 They make a great gift for children, grandchildren, nieces, nephews, neighbors and so on...at only $13.95 a kit! If you would like to order stamps, papers, inks, tattoo kits etc., or anything else for holiday gifts, just click on the HOLIDAY GIFT PACKAGE on the left to link to a Holiday Wish List...fill one out for everyone in your family! Email or call me to place your holiday order! If you order $100 or more I'll give you a FREE copy of the Stampin' Up! Spring-Summer Collection catalog coming out in January! Don't have a catalog? CLICK HERE to view the Fall-Winter Collection or the Holiday Mini Collection ONLINE! I will post more projects again soon, so check back! meanwhile, don't forget to LEAVE ME A COMMENT!